You are at:Home»Category: "Reader Content This Month"
The FREE Fujifilm Galleria of Landscape Photography Magazine has been released and is ready for immediate download. The FREE ANNUAL issue of Landscape Photography Magazine has been released and is ready for immediate download. On May 2018 we will publish a special section showcasing the inspirational nature of night-time photography. Join us, upload your picture today. Flickr Group • Join Us Today! Every month we publish a book review. Are you just about to release a book? Have you already released one and wish us to have it reviewed? Do you have our next magazine cover? 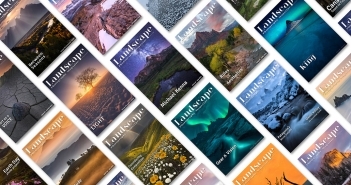 Now is your chance to upload your picture and see it published as the cover of Landscape Photography Magazine. See your picture displayed as the Splash Screen on our website for a full month. Your name will be displayed on the picture also. Have you created a landscape photography slideshow or timelapse video? We are here to help. Your feature will be promoted to over 500.000 followers.